Safe, reliable in operation with minimum maintenace. High efficiency and small handpull. Fine apearance with small size. Available in 1-Tons to 10-Tons capacity. 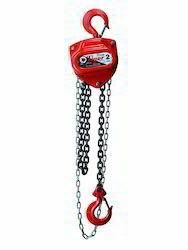 - Safex chains pulley blocks are designed & manufactured in accordance with IS 3832 & are available in Hook suspension type: push-pull trolley type hand geared trolley type. 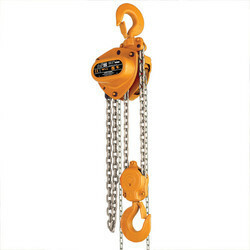 Load chain used is graded alloy steel chain & hand chain is m.s. calibrated to relevant I.S. standards.